COLLECTOR: Bill Belfield is ready to hit the road. WHEN Bill Belfield was a young tacker, he thought that his friends were a bit weird - they didn't have a Sherman Tank in their back yards. "For as long as I can remember we always had one. I didn't think that was anything unusual. I grew up with them all around me. "My mates loved to come around and play in them. They can be a death trap and they can be a whole heap of fun too." Bill's father, John is a self-confessed, obsessive collector of anything military. We're not talking just trucks, but tanks, jeeps and the whole catastrophe. John Belfield was an auto engineer specialising in trucks. He extended wheel bases, repowered them and ended up specialising in right-hand drive conversions. Through this time his collection of military vehicles continued to grow, so much so that 18 years ago he took a punt and opened up the Melbourne Tank Museum at 456 Belgrave -Hallam Rd, Narre Warren North in Victoria. John and Bill had to scrape and pinch to get the museum up and going. The museum had 95 vehicles on display - a massive investment ranging from tanks and army cars to trucks, motor bikes, artillery pieces, anti-aircraft and anti-tank guns. 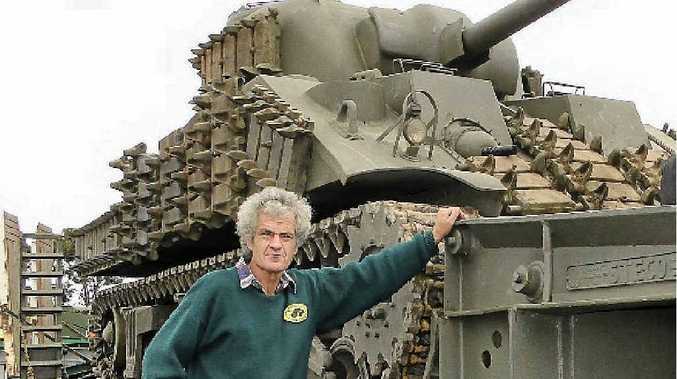 "There's one thing about collecting military vehicles," says John. "You don't have to worry too much about the paintwork - no scrolling, etc to be done. I may not be the world's best panel beater but I'm good enough for this stuff. I went to night school and learned to bog-up, which is good enough for these. We're not aiming to win any pride and polish competitions." None of the vehicles at the museum were on loan. Everything had been bought by the family with nothing donated. "We worked bloody hard for everything we got," said Bill. "There was no support from the defence forces. "As soon as the shed was empty we started putting vehicles back in it. "Now it's well on the way to being full again. Dad's incorrigible, and I guess I'm not much better," laughs Bill. "So much for selling up because we couldn't afford it! The stuff in there now is as interesting as what was there previously." On display was an early Sherman Tank that starred in the TV series, The Pacific. Bill, who spent 21 years in the army reserve as an armoured recovery mechanic was involved in the production as chief engineer, advisor and teacher on how to drive the vehicles - "A great experience." The tank was rebuilt for the series. The bottom half was original with the top half being mocked up. The show needed three such vehicles in a film sequence and they couldn't be found anywhere so it had to be built. This is where the Belfield's expertise came to the fore. "There's no shortage of money when it comes to making movies," says Bill wistfully. "I was told they spent $250 million on it." Also displayed was a Kaiser prime mover, circa 1952 - popular with the Australian Army for use as a recovery vehicle. "The guy who bought it from the army originally, converted it into a prime mover. "The steco float behind it came up soon afterwards. "We had to do a lot of work on the truck to get it up to standard. "Having our own float and prime mover to move things around makes life a lot easier - and cheaper in the long run. The Kaiser fits in with the military theme. "Founded in 1945 Henry Kaiser, an American industrialist joined forces with Joseph Frazer making sedans and sports cars. "They were one of the few manufacturers to make a profit in the years following WWII. In 1953 they bought the Willys-Overland Company (Jeep) and this led to the heavier vehicles produced for the armed services. Bit of a twist - a German name on American trucks." A lot of hard work and expenditure of cash was required to gather such a collection together and it would be a crying shame to see the Belfield's forced to part with it again. Big Rigs wishes them success in their endeavours to retain an important part of mechanical history.